I've long been intrigued by this photograph in the Library of Congress, which has been posted for several years without any identification. Lately, though, the artist is identified as Kate Clayton Donaldson who did the piece above. 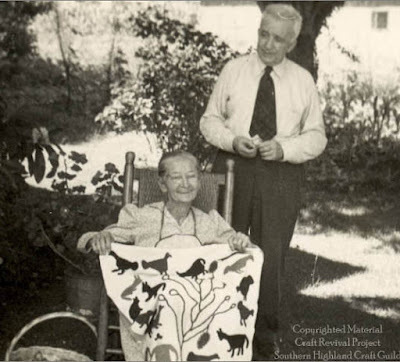 The photograph was taken by Doris Ulmann about 1934 for a series she did with Allen Eaton for the 1937 book Handicrafts of the Southern Highlands. Just what was in that cardboard box? And is the woman making a quilt? 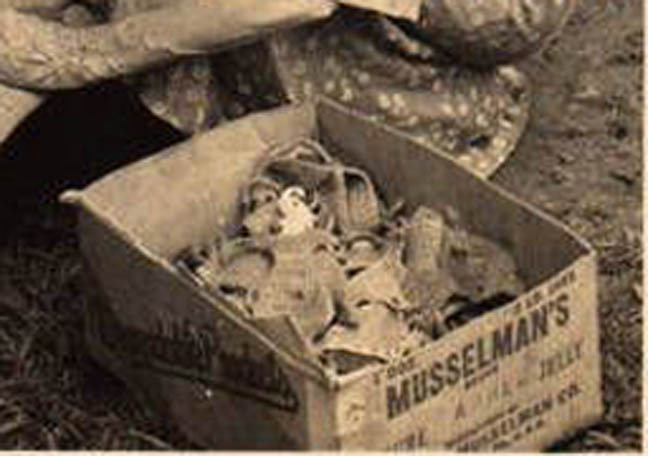 I now realize that the box is full of crocheted figures. 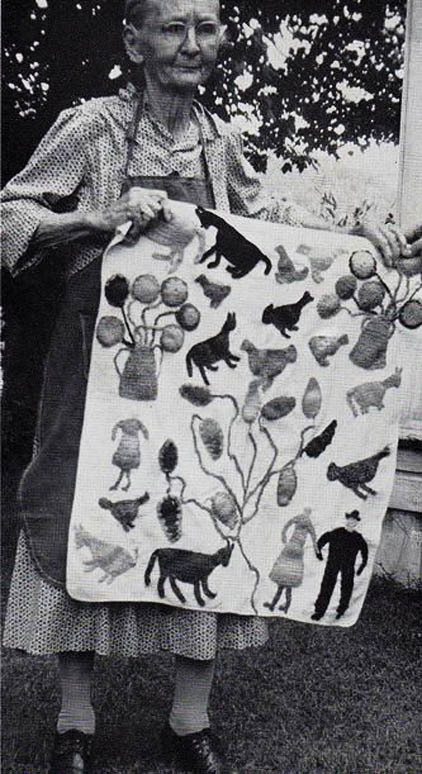 She is not making a quilt but rather an appliqued picture. Catharen Clayton of Cherokee County was born in Kentucky on April 19,1870 and died on August 1, 1960 according to her tombstone and death certificate. Her method seems to be chain-stitching motifs and then assembling them onto a small piece of coarsely woven wool or linen. 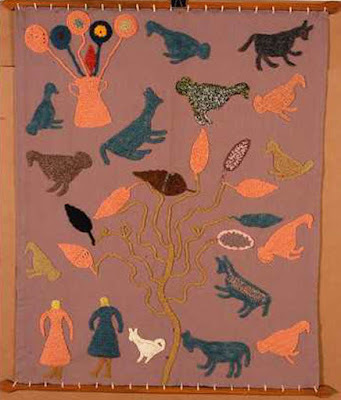 A prominent tree and some free-form animals link the work to traditional Indo-European imagery. UPDATE: Dot commented: "The figures look to be made with a double crochet stitch, not chain stitch. Some of the wider vines are also one row of double crochet; others may be chain stitch." She may have dyed the yarns in the figures and the backgrounds herself. 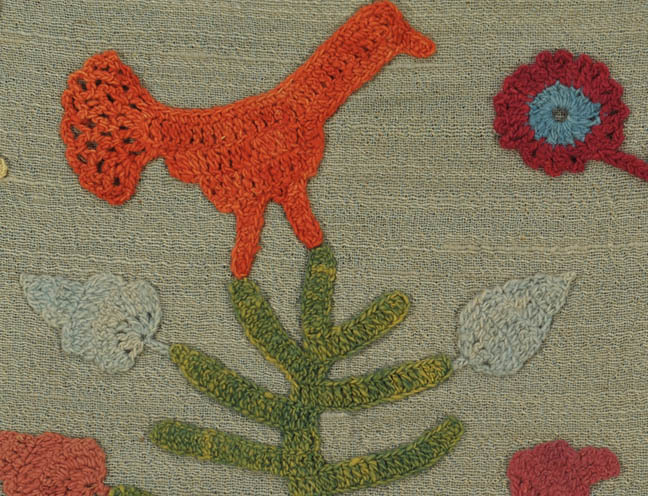 Because it is "folk art" the thought is she was using "natural dyes" but the way the colors are fading looks more like the synthetics in the packaged dyes that were readily available in North Carolina in the 1930s. 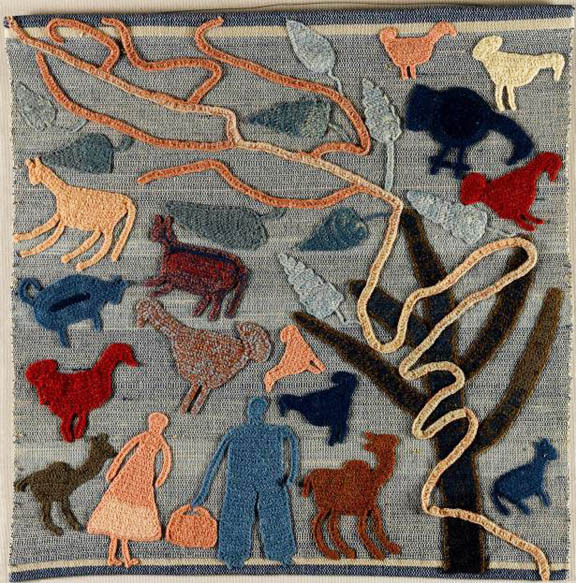 Kate and her story illustrate a point about our attitudes towards the makers and the work. 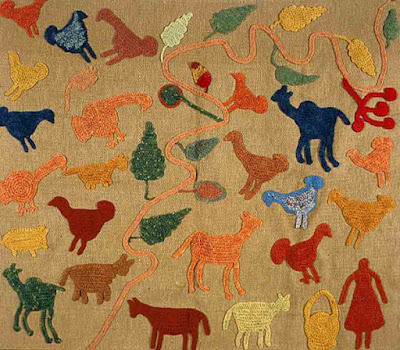 She is considered a folk artist but she was also a commercial artist. There are several origin stories about how she began creating her small compositions. founded to teach marketable craft skills to local residents. 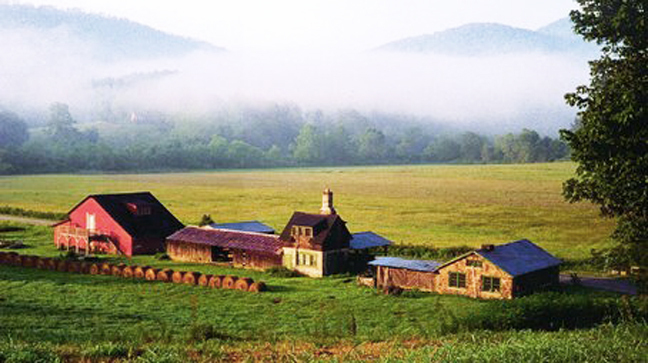 The probable truth is that in the early 1930s she was working in the kitchen of the John C. Campbell Folk School in Brasstown, North Carolina, 10 miles from her home in Marble. 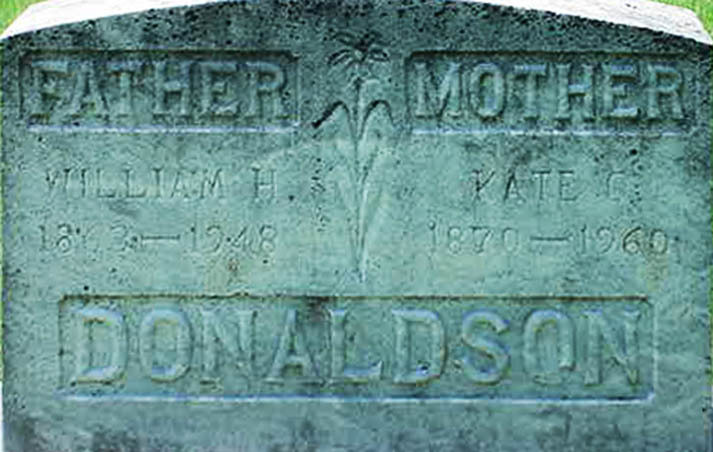 Her grandson Hayden Hensley was a student at the school in the late 1920s, learning woodcarving. 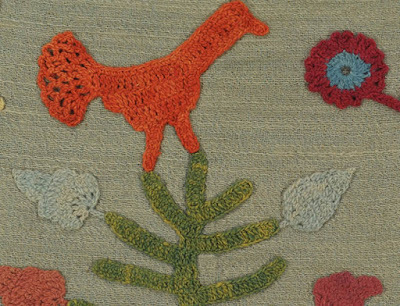 She had stitched crocheted figures to an old baby blanket and liked the results well enough to show it to the people in charge of the adult education center. They were impressed, saw the commercial viability of the small piece and encouraged her to make more to sell. to provide an income for Southerners. She met Allen Eaton of the Southern Mountain Handicraft Guild, a cooperative marketing crafts. He and Doris Ulmann interviewed and photographed mountain artists for their survey in 1933 & 1934.
showing him how she works. 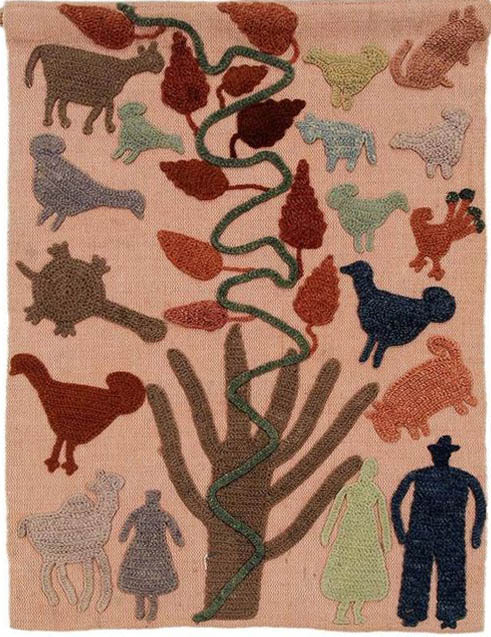 "Many parallels have been made between the cow blankets of Granny Donaldson and the Po Valley fashion blankets made by women in Italy. In Italy, the blankets are used to proclaim the spirit of life and are worn by cows during festivals. Donaldson never heard of the Italian cow blankets and says that she didn't own a cow when she began her first blanket, although rumors still remain that she copied the Italian blankets for her cow, Bessie." Another version is that she made an appliqued blanket to keep her cow warm. This piece of functional art was noticed by a passing art lover. 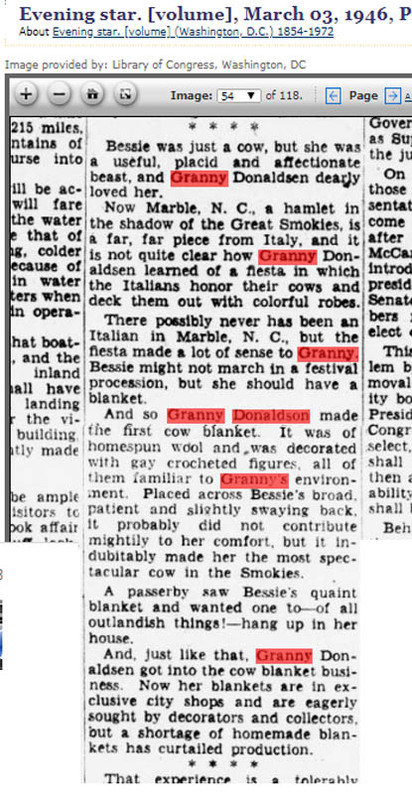 The culprit in the cow blanket story may be a feature writer named Bill Sharpe, "Steeped in the Lore of North Carolina," who published an article in the Washington Star on March 2, 1946 with a few paragraphs on Donaldson and her cow blankets. In this story a passerby noticed Bessie the cow clad in a Donaldson blanket and the rest was history---or folklore---or what people wanted to hear about North Carolinians at the time. Do note another folky touch in that she is known as Granny Donaldson. 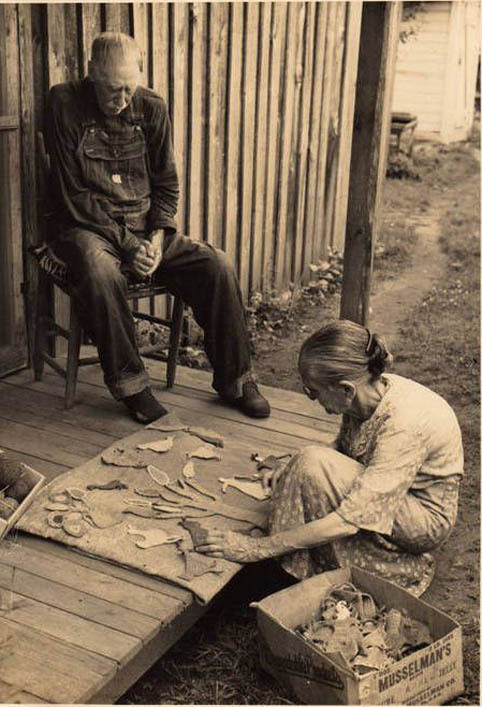 How come men artists are never known as Grampy Bill Traylor? 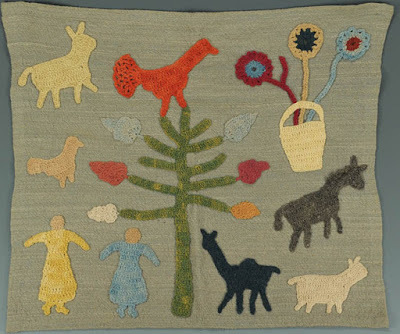 The textiles are fun to look at and there are a lot of them in the folkart market over the past years. 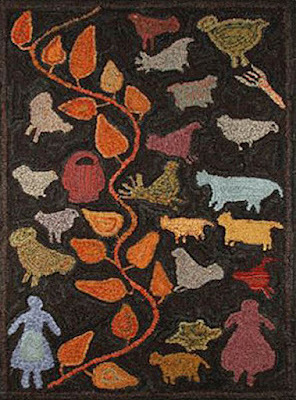 "Farm Animal Pictorial Wall Hanging. c. 1980's. Knitted and hooked yarn on cotton backing. A few minor holes, otherwise great condition. 27" x 34"h. Provenance: Sally Cathey's Blue Ridge Weavers, NC, a copy of the envelope that Granny Donaldson used to send the work to Sally Cathey accompanies the piece. Est. $500-800." Didn't "Granny" die in 1960? Donaldson at work with a crazy quilt on her chair. Don't call them cow blankets and don't call her Granny, unless, of course you want to set my teeth on edge. Best post ever!!! Granny Donaldson has been one of my idols since I first saw that photograph and learned who she was. My husband actually found it years ago and said, "Look honey, that's us in our retirement"! Of course I couldn't kneel like she is doing now in my sixties, let alone in my 80's, but I do love her work and I think she is "cute as a button". You have found some images of her work that I have not seen and I had never heard of the cow blanket story. Thanks a million! Wow! What a story! Which one to believe??? LOL I've seen the b&w photo and have always been intrigued. Love the one with the woman with a handbag on her arm! It's on a dark blue background. That is amazingly creative crochet. especially working at the handicraft guild where there would've been inspiration to create. 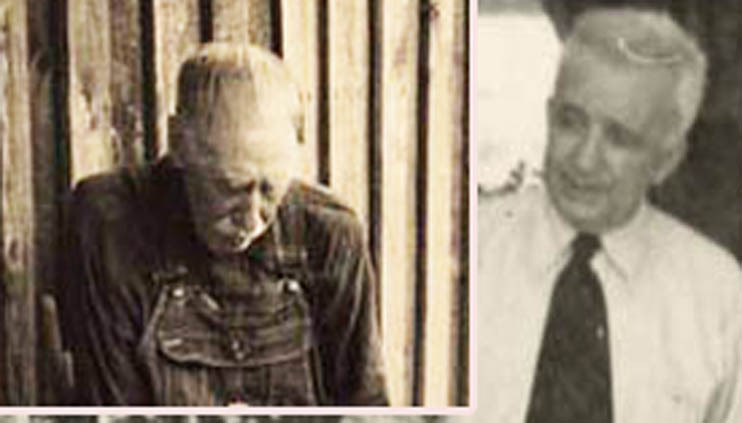 I think the gentleman in overalls in the photo is her husband and he has that farmer look. My Gramps was a farmer. It's fun looking and thinking about the creative people who came before us. I'd love to know where Kate was born in Kentucky. Why do people who write about art have to think something is a copy of an earlier work? Some people who work with sewing and knitting and crochet like to improvise. My grandparents, aunts and uncles had farms, one of them a dairy farm, and I've never heard of giving a cow a blanket to keep warm. I'd dure like to see those Italian cow blankets. My father's mother was from the Appalachian region of eastern Kentucky where there was a lot of "folk art" and "folk music" going on, but no one from Italy anywhere in sight, in fact I think Italians in that region would have been quite scarce. Fascinating woman, insightful post. I find Her Work FANTASTIC, WILL NEVER FORGET HER ART. Hi am Name Renee thanks for Showing Us. Thank you for explaining this. 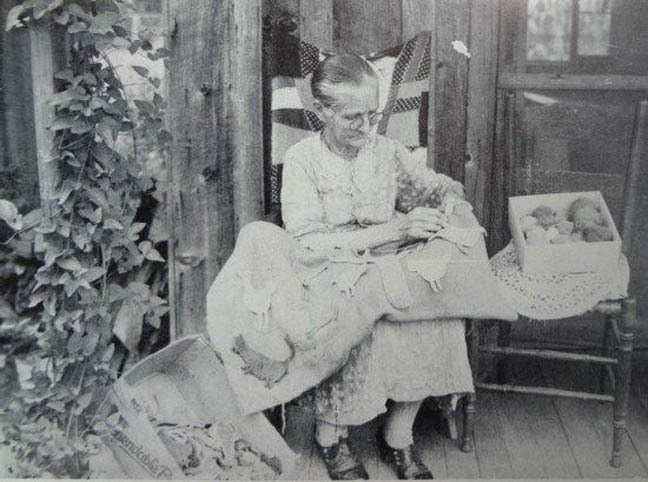 I had seen the photo of her stooping before the porch and thought she was placing appliqué pieces on a background. Her art is beautiful and inspiring! What a fascinating post. 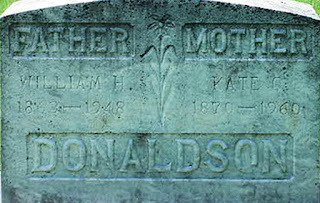 I had never heard of this Mrs. Donaldson and am so pleased there is so much information on her and her artwork. You are quite the investigative reporter. Oh wait, you're a historian - same thing. 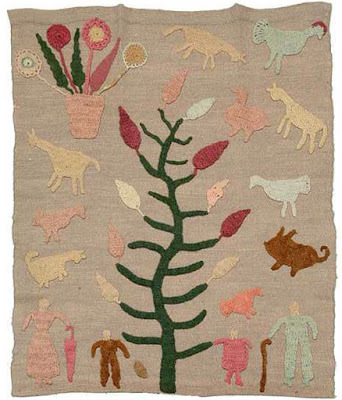 FasinatFasc post - I made a crewelwork alphabet sampler similar to these when I was a young girl - bet they stole her design. Another example of a true artist relegated to "other" as a folk artist. Note the change of her name to Granny! I loved studying her compositions. The tree and vines are intriguing as they intersect the pieces. Oh my, leave it to a unenlightening reporter to call her Granny. 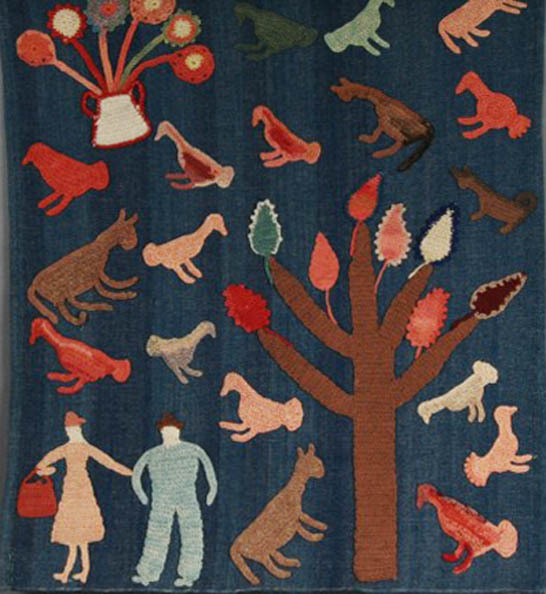 I love folk art. To me it is the freest form of self expression. It seems to come from the heart, not the head. Too bad it doesn't get more credit.